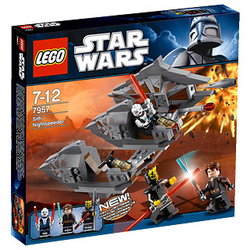 7957 Sith Nightspeeder is a Star Wars: The Clone Wars set released in June of 2011. The main body features a double connecting system with two flick-fire launchers attached to slanted tiles to the right of a side ram build with slopes facing SNOT. Two speeders can disconnect and connect to the main body from just a shaft stick. 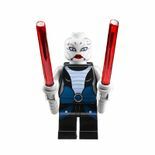 This set is based of the Star Wars: The Clone Wars episodes "NightSisters" (Anakin Skywalker and Asajj Ventress) and "Monster" (Speeder and Savage Opress). The Sith Nightspeeder was a type of speeder used by Nightsisters on Dathomir. The speeder could carry one pilot and one passenger. Nightsister Asajj Ventress used a Sith Nightspeeder to journey to the Nightbrother village, in the hopes of finding a suitable warrior as a new apprentice for Count Dooku. The warrior was to be used to gain the Count's trust, then to kill him. When Ventress selected Savage Opress as the most suitable candidate, he left with Ventress in this speeder. This is a description taken from LEGO.com. Please do not modify it. (visit this item's product page) Use the Force to fight off the stealthy Sith Nightspeeder™! Sith Assassin Asajj Ventress and Savage Opress are speeding toward Anakin Skywalker on the stealthy Sith Nightspeeder with flick-missiles. Detach their twin pods and close in on the young Jedi warrior! Will Anakin Skywalker be able to fend them off? You decide! Features 4 lightsabers and weapon! Detach the twin pods from the Sith Nightspeeder for a multi-directional attack! 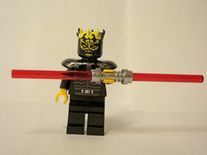 This set is also part of set 5000067 Star Wars Sith Kit. 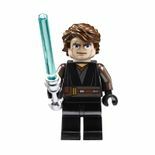 The Anakin Skywalker and Asajj Ventress minifigures are new to the set. Savage Opress is exclusive to this set. Facts about "7957 Sith Nightspeeder"
Use the Force to fight off the stealthy Sith Nightspeeder™! This page was last edited on 9 January 2016, at 22:17.